Habit: Annual, emergent or terrestrial, glabrous. Stem: reclining, 10--30 cm; lateral branches erect, slender, stiff, fleshy or not. Leaf: cauline, narrowly triangular, entire, sessile, early-deciduous. Inflorescence: raceme, terminal; axis +- zigzag; bract 1 per flower, 6--12 mm, ovate, leaf-like, spreading; pedicels 6--20 mm in fruit. 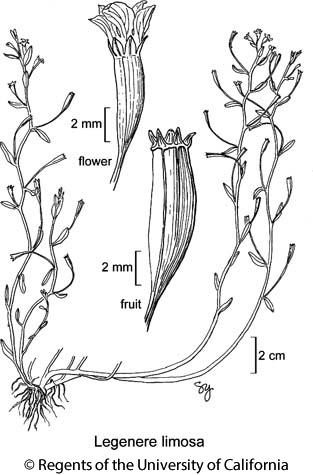 Flower: not inverted; sepals 1/6--1/4 ovary, triangular; corolla white, 0 in lower flowers or not, tube +- 1.5 mm, cylindric, split abaxially +- to base, 2-lipped, 2 abaxial lobes +- 2 mm, narrow, erect, 3 adaxial lobes +- 2 mm, obovate; stamens fused into tube, anthers 0.5--1 mm, free in age or not, 2 shorter minutely appendaged; ovary inferior, +- 3.5 mm, narrowly obconic, stigma head-like, smooth. Fruit: 6--10 mm, 1--2 mm diam, +- > hypanthium, cylindric, top rounded, chamber 1; open at top. Seed: 1 mm, elliptic, shiny, chestnut-brown. Citation for this treatment: Nancy R. Morin 2012, Legenere limosa, in Jepson Flora Project (eds.) Jepson eFlora, http://ucjeps.berkeley.edu/eflora/eflora_display.php?tid=30433, accessed on April 19, 2019.
s NCoR, s ScV, n SnJV, SnFrB (Santa Cruz Mtns, Mount Hamilton Range). Markers link to CCH specimen records. Yellow markers indicate records that may provide evidence for eFlora range revision or may have georeferencing or identification issues. Purple markers indicate specimens collected from a garden, greenhouse, or other non-wild location.